(Android) Flash Player M(Media)-Browser Plus(+) can play and browser flash files about flash files and other media files on your android mobile phone. 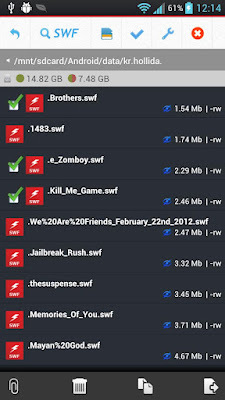 This app may help you enjoy a SWF Video, Game, Apps by your android phone. You need to install Adobe® Flash® Player Plugin before using this player.This Plugin is compatible with your Device. On your Android mobile phone, you can browsing and searching the SWF file, other media files(video, audio, image, doc etc). - Built-in swf flash player & viewer (Support Android 4.x.x)!! 3) Select the flash(swf..) files and other media files to play.